Getting rid of clutter can help to keep your home in order. It can help provide you with more living space to cater to your aesthetics. But what happens when your workplace is getting too cluttered? What are some of the things to consider when starting a commercial junk removal project? Can you and your coworkers afford to haul all those old desks and filing cabinets down to the curb? Instead of straining your back and wasting company hours, consider another option. “Trash is trash” is something you might be telling yourself. 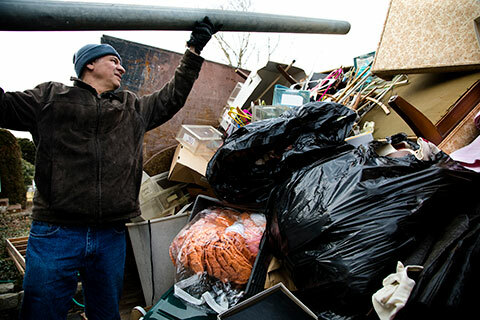 However, there are many differences between commercial and residential junk removal. One such difference is the method. For example, residential removal requires the use of bins, and you must remove the clutter from your home yourself. Commercial removal provides deep containers for large equipment (such as printers and monitors) and may offer the workforce to help businesses haul those heavy items down to the dumpsters. Should you recycle your commercial junk? Can’t you simply toss your old equipment to the curb for anyone to take? Sure, you could, but there can be environmental impacts from leaving broken equipment out on the ground. Dangerous chemicals can leak, and if there is glass involved, people can be severely injured. Instead of leaving this old equipment to fate, commercial junk removal can help to sort out what is and isn’t recyclable so that many of your old stuff can be reused or turned into something new. Think of it as those recyclable blue bins you put out by the road with your residential junk removal, except someone else is sorting all the material for you. How should you schedule commercial junk removal services? If you’re starting to see a serious clutter problem, whether it’s at home or work, you can benefit from professional junk removal. However, there are some essential questions you should first consider finding the right help for you, as not all companies provide the same service for the same price. Booking for commercial or residential junk removal does take some vital scheduling, and prior notice before these services are at your beck and call. Get your office decluttered so that you can have a happy, healthy and productive environment to thrive! If you’d like to know more about the services provided, please contact the experienced professionals at Kloos Hauling & Demolition. We offer fast and friendly junk removal services for commercial enterprises of all types. Also, we give free estimates for a job of any size –204.955.1188 – so make it a Kloos call today! Posted in Blog and tagged Debris Removal, Hauling Service, Junk Removal.